1862: Opening of his 4th Salon: December 1862 – April 1864 on Wallfischgasse Nr. 1221, later Nr. 8. 1865: Retirement of his job in the financial ministry in October 1865. 1865: Journeys with his show “An hour of deceptions” in the Austrian Monarchy (Today: Austria, Czech Republic, Slovakia, Hungary, Slovenia, Croatia and North Italy) as well as to Berlin and Munich. 1875: Death after becoming seriously sick in February 1875 on 11th of March and buried on the 12th of March 1875 in the Vienna central cemetery. Without a doubt the most important Magician for cards magic of all times, employed in the ministry for finances in Vienna as a clerk, enthusiast in the art of magic, beloved by the Viennese society for several decades, represented for sure the attitude of the 19th century. Many facts would be forgotten so far if there had not been the young eager Amateur magician Ottokar FISCHER more than hundred years ago, who found by chance one of his pupils. Fischer was supposed to write an obituary about this man and found him still healthy and alive. It was Georg HEUBECK. FISCHER got to know a lot of HOFZINSER`s experiments and art pieces. Since that time he donated his life to researches about HOFZINSER and his tricks. In two books “J.N. HOFZINSERS CARDCONJOURING” (1910) and J.N. HOFZINSER`s ART OF MAGIC” (1942) he published his researches which represent still the basic of many themes, variations and ideas in the art of Magic, specially for card magicians all over the world. FISCHER confessed that he did not find a lot of personal information about HOFZINSER. He based his knowledge mainly on delivered stories and information by HOFZINSER’s friends and pupils and on detected letters and manuscripts as well as on several magic props of HOFZINSER which he got from his friends. Verbally hand down information contains variations and incorrect dates by the persons because sometimes they forget important facts or describe them in a different personal way. During a press conference concerning the magic convention “Merlinale” in Vienna in 1991 I presented Viennese magicians like Leopold Ludwig DÖBLER, Anton KRATKY_BASCHIK and Johann Nep. HOFZINSER and described them as famous representatives of the Austrian school of magic. By an interview with one of the journalists who was very eager to get to know more about HOFZINSER my research started. This men wanted to write an article about HOFZINSER as he wrote for a magazine of the financial ministry. Just for fun I asked him to check the archives of the ministry in exchange if there are still files about J.N. HOFZINSER. After several days I got the message that there were still personal files about HOFZINSER with hand written documents which alert my interest immediately. I found more than one but several documents about his duties, fees and his petition for pension in 1865 and the one of his widow. In the meantime I found more and more in other archives, concerning his military duties, petition for payments in advance and more holidays, his birth certificate, his marriage certificate and many other documents. Today after many years of research I am still convinced that much information in the life of HOFZINSER were delivered in a wrong way and therefore were interpreted in a wrong way too. His influence for the art of magic as founder of the new style in card and Salon magic equals the influence of the French magician Eugéne ROBERT-HOUDIN as inventor of many illusions for the stage magic. HOFZINSER’s star has more glamour in the United States. In the last years many wrong information was spread through all the magic mediums. So let me put this information in the right position. There are 41 personal letters, many different documents, many different magic props, playbills and around 270 manuscripts by himself or written by friends of his in the different collections. I collected more than 2500 news paper articles and hundreds of advertisings about HOFZINSER’s “An hour of deception”. They all are wonderful testimonials about his life. It is a must to correct a lot of wrong descriptions of his tricks, to publish interesting stories about him and new effects he did in hid shows. There are also new letters of his which show new aspects about HOFZINSER’s commercial side. In the now found newspaper articles of that time the programmes of HOFZINSER, his dress, his presentation, his person and character are described precisely. FISCHER did not know specially the reports about his “Salon” starting 1857, when it became famous for the next eight years. Otherwise FISCHER would not have made so many false conclusions which were the basis for later articles about HOFZINSER. HOFZINSER’s grandmother carried the family name “Sigmund”. The same name “Sigmund” carried also the mother of the very well known magician of the time of Biedermeier Leopold Ludwig DÖBLER. She was a born “Sigmund”. Both were probably related and were maybe cousins as HOFZINSER writes in one of news paper his critiques about DÖBLER about “his cousin Döbler”: Both families spent also their holidays in the “Sauerhof” in Baden, near Vienna around 1815. It still exists. DÖBLER probably influenced HOFZINSER with his magic and made him interested in it. How did HOFZINSER become a doctor title? Concerning the registration forms, the lists in his schools and about his duties at his work which still exist he did not study and did not get a doctor grade at the university. He did not even become named a doctor of honour. The title appeared only in advertisings, play bills and hotel lists after his retirement 1865. It is a “coffee house” title as it is called in Vienna which he used when he started to go on tour with his “Hours of deception”. 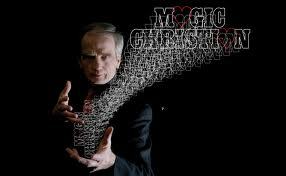 Other magicians named themselves bombastically “Professor of Magic”. HOFZINSER used the title “Doctor” to be different. He always wanted to be different. 3. HOFZINSER, AN EMPLOYEE OF THE MINISTRY WHO IS NEEDED ON MANY SPOTS. 1824 HOFZINSER becomes a prentice in his father’s Silk and haberdasher shop still 18 years old. From 1825 on he serves as probationer at the royal and imperial tobacco company. After several years he becomes a 2nd official, a rather low rank in the employee’s hierarchy. 1839 he changes by a clever idea into the financial ministry: He changes his job with another employee there, who had a lot of debts. Hofzinser pays him monthly a certain amount of additional salary. The job rotation became approbated by the government. HOFZINSER becomes “Registrant” in the “Hofkammer” (from 1848 on it was called financial ministry). He served also as additional cashier in the Cameral-department, in the printery of the State and in the Registration. 1865 he retires by means of two medical certificates which were made by complaisance. Sept. 21st 1854 Hofzinser married the 27 year old Miss Wilhelmina Bergmann, who came from a mining engineer family, or goldsmith and jeweller family. There are still some unfinished investigations but it can be said by reading the certificate of baptism that Wilhelmina was an illegitimate child. The family probably came from Bohemia. *The clairvoyant: Tomorrow (Saturday) evening, at 7.00 p.m. Mrs. Wilhelmina Hofzinser will give the first performance in her Salon in the house near the “Stuben” door of the town wall”. The programme contains following ten parts: 1. The omnipotence of the ladies. 2. The thought. 3. The association of thoughts. 4. The forced thought. 5. The might of believing. 6. The three powers. 7. Training of money. 8. The Somnambulist. 9. The oranges. 10. The vanishing cabinet. Until his retirement in 1865 HOFZINSER carries on with his Salons at least five different addresses which can be proofed. Some are still maintained as buildings. He performed always in the winter season, mostly from November to April. Sometimes he travelled also to Graz, Brno and other cities for a short time though he still was employed as public servant. There are many hints about the content of his programmes and his presentation. Most of the times the real “splendid atmosphere of his Salon” and the “comfortable nearness” is described. Paintings in gold plated frames, among them one of Hofzinser himself by Josef Mathäus Aigner, painted after a lithograph of August Prinzhofer, which got lost. A portrait of his wife Wilhelmina decorated the Salon as well. Comfortable arm chairs and seats were available for the visitors too which had to pay up to 2 1/2 florins for the best seats. Most of the time his performances were sold out and some extra presentations had to be included many times. Three or four times in the week Hofzinser presented his programme which he changed several times in the season. “We – i. e. Prince Carnival and me, the devil – stay in the Salon Hofzinser and are exceptional anxious to admire the arts of the clairvoyant, a mind reader, a lady who can see even through a board of wood, even there is no hole in it. The astonishing card tricks and deceiving of Mr. Hofzinser don’t force a kind of smile of admiration, everything is done naturally and speed cannot be called witchcraft but a clairvoyant, a magnetized, a mind reader of the volume of Mrs. Hofzinser is a very seldom and strange appearance and enables to heat the quicksilver in the thermometer of eager curiosity, to the extreme exhaustion. Finally the clairvoyance starts, no, not yet. The lady devoted to mind reading must be stroked before she is able to see brightly, i. e. must be magnetized. The impossible happens. The weak man put his robust wife in the desired condition, she falls asleep. Or what? The game with the questions and answers starts: Frau Hofzinser knows everything, even what she does not know, she sees everything, even what she doe not see and she hears everything even what she does not hear. The neighbour on my left, who was so astound that he did not get into the level of understanding, regretted that it was winter time, in summer Mrs Hofzinser might hear the grass grow [gets wind of everything] and sees the smell of violets with closed eyes. – Wonderful! The lady is asleep longer than her husband wants her to be, he awakes her waving the light in front of her eyes several times. She awakes. Wonderful, what human hands are able to create, when they touch nearly the tip of the nose of a sleeping woman with candlelight. Prince Carnival and me, we took the overwhelming impression back home from the Salon Hofzinser. Pert like ever I could not suppress the remark when we left: The foolery season promises very well this year and it starts like it ends normally by its rules with “Carnival tricks and pieces”. No other report of tricks could describe the atmosphere, the presentation, the appearance of the persons and the general impression on the audience better than this article. FISCHER never described much about the clairvoyance part of Madame HOFZINSER. In January 1858 for instance several magicians preformed in Vienna at the same time. In the suburb Magdalenengrund one could seethe two escamoteures BRUNNER und GROTTE, in the concert hall of the society of music friends Adolf BILS from Athens, who made his wife “vanish”. The competition stimulated ideas. HOFZINSER offers 1000 Ducats to that person who is able to imitate and repeat the card tricks, which he presented in his Salon. Some days later the magician BILS , who works in the concert hall Musikverein offers 2000 Ducats to that one who can surpass him with dexterity. The next advertising excels everything as a Mr. Willsin of the USA will arrive in the autumn and will present all his tricks with extraordinary dexterity and with fine kid-leather gloves. Which fight for the spectators of Vienna, who liked this kind of competition, occurred you might guess because the new advertisement of BILS offered to present all his tricks with gloves on the spot. 6. Salon: 1868, Only some performances in the Hotel Weisses Ross, Große Fuhrmanngasse, today the City Hotel in Taborstraße 8. Again and again HOFZISER includes new tricks to his programme. Tricks like “The Mail”, “the torn one” and “Philadelphia’s most interesting trick” appear and are praised as the “culmination of deceiving”. Did anybody hear from the trick called “The oracle of the ladies in the harem in the night of the second Beiramfestival” which HOFZINSER presented 1870 in Gmunden? In the new and 2nd volume of the book you can expect new routines and a chapter of the “fine nuances” in card magic. In the third volume you will experience the tricks of his Salon magic. The voice of HOFZINSER was – concerning many reports of newspapers not enough powerful for large theatres. Probably this was the reason that he preferred to perform in the Salon, where he was – like Mrs. Herrmann brought it to the point – “a god”. During his life time already HOFZINSER sold many of hid experiences to his friend who practised magic. He invented a lot of tricks and new routines for his friend Compars HERRMANN and revealed the secret of the piece “The forced thought” for 200 florin to a rich English man, named Mr. Clite, who wanted to get to know it absolutely. Contrary to Ottokar FISCHER who disseminated the opinion often, that HOFZINSER kept his secrets like his eyeballs, newspapers reported that HOFZINSER gave as well magic lessons in his Salon. For sure HOFZINSER was the most creative magician of his time, who understood to combine the zeitgeist with fantasy to wonderful magic experiments and included satire political remarks – like his contemporary poet Johann Nestroy did in his theatrical plays. Probably n 1844 HOFZINSER was already in Paris where he met Hector Berlioz. Later he came to Graz several times during his duty as public official (1845. 1862), to Prague (1858), Berlin (1861) and Brno (1863). 1865 he started to travel after his retirement to these places where his prototypes and friends BOSCO, DÖBLER und HERRMANN were already before. In the years 1865-1874 many performances by him could be found by studying local newspaper articles in Graz, Marburg, Laibach, Preßburg, Budapest, Vienna, Krakau, Troppau, Linz, Salzburg (theses were known), St. Pölten (the poster is known already), further in Münich, Wels, Gmunden, Steyr, Bad Ischl, Krems, Korneuburg, Berlin, Lemberg, Czernowitz, Wiener Neustadt, Znaim, Pilsen, Eger, Karlsbad, Marienbad, Franzensbad, Brünn, Breslau and Triest. HOFZINSER travelled also to the south to Slovenia and Croatia several times. In the newspapers wonderful critiques could be could. Most of the times the whole programme was listed too. The Viennese National library is – thanks god – full of old Austrian and the most important foreign newspapers which all can be read on micro films. Also in Berlin and Munich and Prague I looked through the appropriate papers. Many places like Dresden or Leipzig, Breslau or Lemberg remain open for researches. Often it is only a question of lack of missing local newspapers and district newspapers of that time to track back the performances in that time as often the artists appeared in private salons and societies like it is still today. The last performance of HOFZINSER is registered in the Viennese news papers close to the new years eve of 1874/1875 when he performed for the Vienna Club of trade people. “In the parish church of St. Johann in the “Praterstrasse” the consecration of the late Prof. J. N. Hofzinser took place yesterday afternoon at 2.00 p.m. Beside his relatives many friends and known people took part there. Nowhere there was a remark that he was poor or was forgotten when he died. He was neither rich nor poor and in no way forgotten by his friends and he did not leave this world in bitterness because of his envious colleagues – like FISCHER adapted it as artist’s fate. Nevertheless he lived in a house, which belonged to the richest and most demanded areas in the suburbs, right beside the famous Carl-Theater since 1869 until his death. In a house in which already the well known poet Ferdinand Raimund, the famous actress Therese Krones, the editor Adolf Bäuerle and the famous painter Wenzel Müller lived before him. Maybe HOFZINSER was just bitter because of his young wife, who married her long term admirer, the rich university professor and house owner Dr. August Biela (+ 1893) one year after his death. No wonder, that she did not want to know anything about magic anymore and that she threw away all the old things one after the other like it is usual founding a new household. When the 25 year old Ottokar FISCHER met her in 1898 to interview her about her first husband after 23 years have passed, the then old lady was not happy for sure as she survived her second husband too and she did not want to know anything about her first one at all. In case she would have thought that the magic of her first husband will be present all over the world after 140 years she might have acted differently.